The Tennessee Overhill Heritage Series documented the turn of the century and illustrated the importance placed on heritage and historic preservation by the people of McMinn, Monroe and Polk Counties. 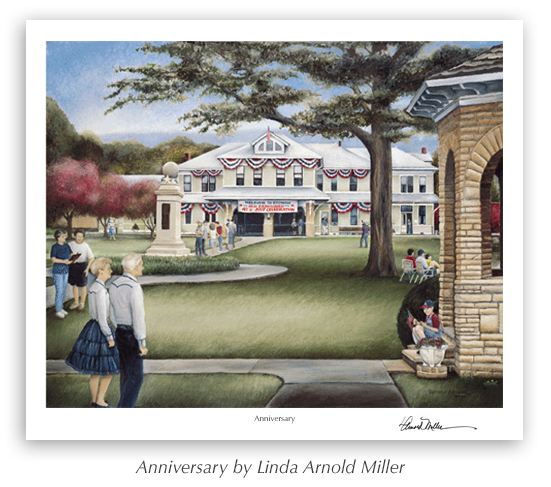 Anniversary was the first in Linda Miller’s Tennessee Overhill Heritage Series of limited edition lithographic prints. It depicts the L&N Depot in Etowah, Tennessee during a Fourth of July celebration. 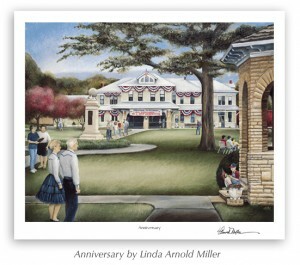 The print is entitled Anniversary because Linda and Jere Miller were married on the Fourth of July and spent many of their anniversaries with friends and family at the Etowah L&N Depot. Why was the Depot built? In 1902 the Louisville and Nashville (L&N) Railroad planned a new, more direct route between Cincinnati and Atlanta bypassing the Hiwassee River Gorge and the Great Hiwassee Loop. Also needed was a new terminus for crew changes to service steam engines and serve as the Atlanta Division Headquarters. 1454 acres for the main terminus (depot), maintenance and repair facilities (shops), railroad yards and proposed township to support the railroad workforce-were purchased at $10 to $20 per acre and the L&N Railroad set about creating a major rail center and the town of Etowah. When was the Depot/Railroad Complex built? In 1906, after the 25 muddy acres chosen for the yards, stops and main terminal were drained and raised 3.25 feet, the first building to be constructed was the Passenger Station/Office Building (L&N Depot) at a cost of $13,000. The totally electrified railroad complex included: roundhouse, sandhouse, cinder pits, coal bin, 4 sets of movable coal chutes, turntable, oil house, machine shop, blacksmith shop, boiler shop, planing mill, cabinet shop, powerhouse, car repair shop, 2 water tanks, car scales, a store, an office freight depot, 145 freight tracks and 5 repair tracks. At the close of 1906 the L&N Railroad had spent $200,000 on the complex construction. In 1916 the present day Portico Room was added to the building to provide more office space for the engineering department. In 1927 there were over 2,000 men working in “the shops” and another 250 manning the trains that moved through Etowah daily-including 14 passenger trains. Today, of the original complex, only the Depot and tracks remain. How long was the Depot in use? Up until the early 1920’s, Etowah’s railroad complex was active and thriving. In 1928 the L&N began replacing its wooden “rolling stock” with steel freight and passenger cars which forced the layoff of 200 shopmen in Etowah. Also that year, the Atlanta and Knoxville division were combined and the Etowah offices were moved to Knoxville. In 1931, the Etowah shop force shrank from 2,100 to 80. In 1968, passenger service ended. In 1974, the Depot had outlived its purpose and it closed. The Depot had been used a total of 68 years. Today, Etowah is still an active rail center. The track located immediately adjacent to the Depot is CSX Railroad’s mainline from Cincinnati to Atlanta. The CSX Yard Office, where crew changes are made, is located just north and across the tracks from the L&N Depot. When was the Depot restored? In 1977 the process began with the Depot being placed on the National Register of Historic Places. The L&N agreed to sell the Depot property for $35,000 and to donate the building to the City of Etowah. The Tennessee Historic Commission pledged half of the purchase price with an understanding the City of Etowah would raise the other half. The old freight depot was cannibalized for the project. The workforce came from the government sponsored Comprehensive Education Training Act (CETA). In 1981, after three years of hard work and $200,000, the fine old Depot was completely restored and once again opened. What is the Depot’s use today? The Depot houses a museum entitled “Growing Up With The L&N: Life and Times in a Railroad Town,” and the offices of the Etowah Area Chamber of Commerce, the Etowah Arts Commission and Gallery and the Tennessee Overhill Heritage Tourism Association. The building and grounds are often used for community holiday celebrations, fairs and exhibits, weddings, club meetings, reunions, family gatherings, art and historical exhibitions, classes/workshops and the Bald Mountain Train Excursion that-once a year-brings passenger trains back to Etowah. What is the stone building in front of the Depot? The “Bandstand” was erected in 1931 in as a memorial to the son of Mr. and Mrs. August McClary. The stone was purchased by the McClarys and brought in by rail. Frank McKinney was in charge of the town band and chose the site for community concerts. Included with the print is the information about the Depot and a sheet of the symbolism used in the artwork.